unch Hate. At its core it is a +25db clean boost pushed over the edge. So it’s dirty with a bit of sheen, grit, and bite. 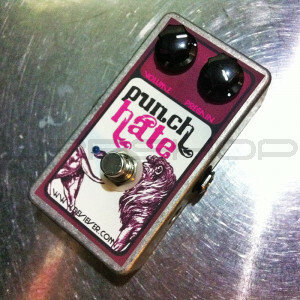 Punch Hate. At its core it is a +25db clean boost pushed over the edge. So it’s dirty with a bit of sheen, grit, and bite. It is not ruthless, but it is mean. It’s the kind of thing you need on sultry summer days when a glass of ice cold lemonade just won’t cut it. It’s the kind of thing you need when all you have is a fly swatter and you’re being attacked my mosquitoes. It’s like that time your grandmother came over and she didn’t have any of those melty candy things because she finally started going senile, so instead you were stuck with some gum she happened to have in her purse. You’ll never forgive her for that…. ever.